A member of the Lamiaceae family, mint (Mentha) is a perennial herb and ground cover that is hardy from zones 3 to 11 on the USDA Plant Hardiness Zone Map, depending on the species. Mint, which prefers sun to partial shade and regular watering, may become invasive and spreads via runners. Plants grow up to 18 inches high and may spread up to 24 inches. Considered an easy-to-grow plant, most mints germinate from seed within two weeks and reach mature size within two months. There are two mint plants that have an apple fragrance--golden apple mint (Mentha gentilis) and apple mint (Mentha suaveolens). Both can grow to 2 feet and are hardy in nearly any zone except the coldest western zones and hot, humid areas like Florida. Golden apple mint has smooth, dark green leaves with yellow highlights. The flower on this plant is inconspicuous, but the foliage may be used in bouquets. 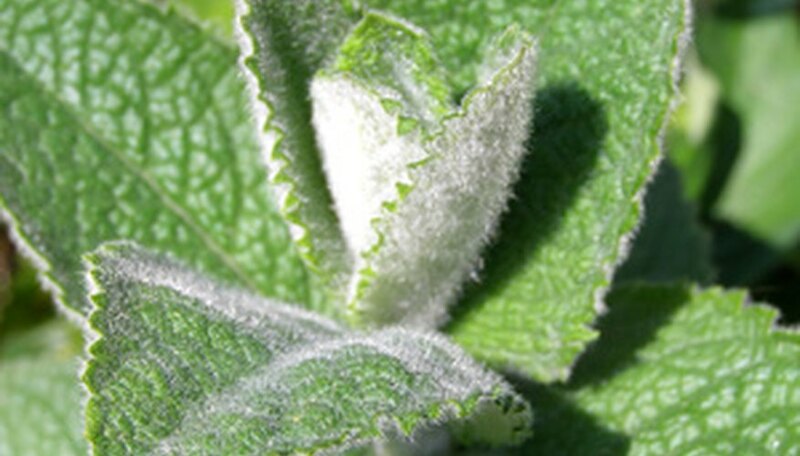 Apple mint has rounded, hairy gray-green leaves and purple-white flowers that grow on 2- to 3-inch spikes. Peppermint (Mentha piperita) is among the most well-known variety in the family and has a strong fragrance. The plant, which is hardy in all but the most hot and humid zones, can grow to 3 feet and has 3-inch-long leaves and small purple flowers on spikes. This popular mint is used as flavoring for tea, in desserts or as a garnish. Orange peppermint (Mentha piperita citrata), also known as bergamont mint, is used in potpourris and the crushed leaves have a faint orange odor. Spearmint (Metha spicata) is another well-known variety that is often used to spice lamb, mixed in apple jelly or as a garnish for cold drinks, such as iced tea or lemonade. Some varieties are hardy to Zone 3 and all grow in all but the hottest, most humid regions. The plant can grow to 2 feet and has dark green leaves and small purple flowers on a spike. Spearmint leaves may be used right from the garden, but also make a good dried mint.